I think the reason Simpson’s/Robinson’s Paradox didn’t jump out at me is that in the instances of that I tend to think about, the relationship between X and Y is conditional on aggregation/disaggregation on some 3rd variable. Like in the kidney stone example from the Wikipedia link, the relationship between treatment modality and outcome is different when you aggregate or disaggregate by stone size. And in the Berkeley gender-bias case, the relationship between gender and admissions rates is different when you aggregate or disaggregate over graduate programs. Berkson’s Paradox fits even better, I think! Yes – this was written up in Slate a few weeks ago under the title “Why are handsome men such jerks?” with Berkson’s fallacy referenced by name in the URL. http://www.slate.com/blogs/how_not_to_be_wrong/2014/06/03/berkson_s_fallacy_why_are_handsome_men_such_jerks.html and tweeted by Rich Slatcher @RelationScience. Yvain in http://slatestarcodex.com/2014/03/01/searching-for-one-sided-tradeoffs/ tries to generalize the idea of Berkson’s paradox even more. I’m most amused by the suggestion to purchase homes on naughtily-named roads like ‘Slag Lane’. > Previously, negative associations between intelligence and conscientiousness have been reported and explained in terms of an ‘intelligence compensation hypothesis’ (ICH) whereby higher conscientiousness develops in order to compensate for lower cognitive ability. We argue that conscientious traits, especially those related to achievement, are just as likely to be reinforced by cognitive ability. We evidence this by showing that previous negative associations may be attributable to a compensatory sample selection effect arising because of the use of research samples comprised of participants with achievement above certain thresholds. The associations between conscientiousness and ability in the samples of adolescents and their parents from the Sibling Interaction and Behaviour Study (SIBS) and Minnesota Twin Family Study (MTFS) – which were not selected in this way – were either zero or positive. 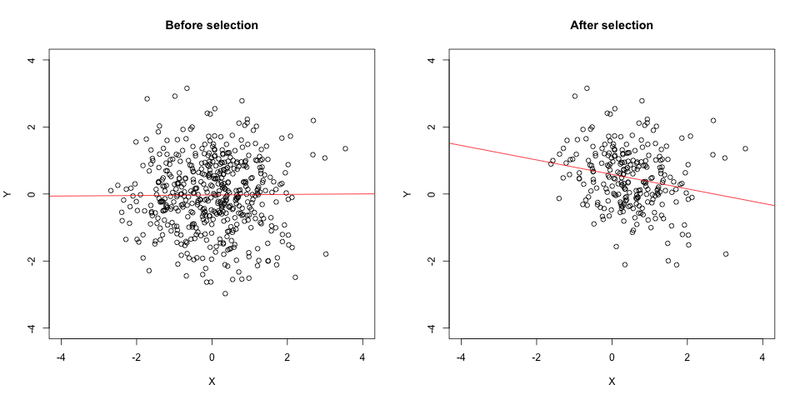 Further, artificially introducing selection on achievement into these samples biased the associations in the negative direction. Together, these results are consistent with the hypothesis that the true association between these constructs may be zero or positive at the population level but that the use of selected research samples has sometimes resulted in the appearance of a negative association. On reflection (aka 20/20 hindsight), this effect is logical. The people who are being eliminated all have GPA and GRE scores that are positively correlated (albeit with the scores themselves having relatively small magnitude, since these are the poor performers on both measures). So the remainder are going to have correlations between the two that are, on average, more negative, simply because the bottom-left corner of the distribution “cloud” has been removed (cf. the “After” plot, above). In the blog post cited by Gwern, this effect is even more pronounced, because another chunk of the people with a positive correlation between GPA and GRE — in this case, with scores of large magnitude — got taken by Harvard. :-) This corresponds to the top-right corner of the cloud in the “After” plot being removed as well. At that point the negative regression line draws itself. And the takeaway lesson, if it needed to be said, is to be very careful in your assumptions about how people came to be in the group they’re in, unless you (or, even better, a blinded confederate) randomly assigned them there. Nick – the Slate post you linked above is a great visual explainer. And it makes it clear that what I was talking about is indeed Berkson’s paradox. The phenomenon does seem pretty straightforward and simple once you know it’s there, and especially when you see it from beginning to end as in the Slate piece. 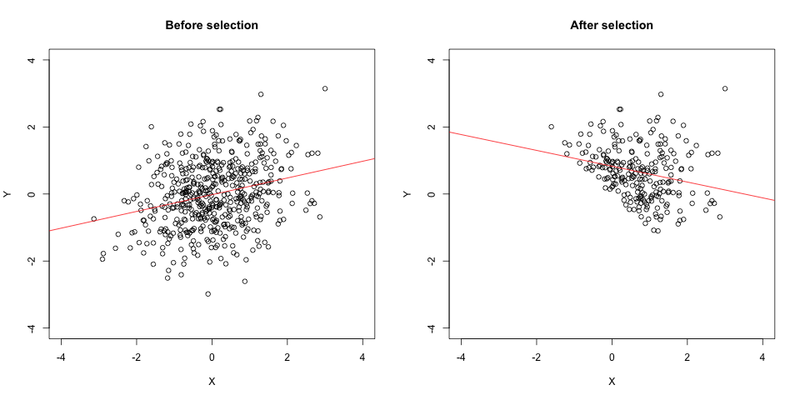 I think one of the reasons it’s hard to notice in practice is that often the only data you have is from the post-selection group, and the footprints of the effect are not necessarily obvious from visual inspection (as in the second simulation I ran). So you have to stop and try to imaginatively reverse-engineer whatever selection processes might have produced the sample at hand. I didn’t mention it in the post but Dawes also talked about the effects that competition would have on selecting out cases that are very high on both. It’s not necessary, but it exacerbates the effect. Oh that? ;) Looks like your Footnote 1 fears were realized… I still thought this was interesting and like the graphical illustrations very much. “Oh that? That’s … ” conditioning on a common effect. It makes the causes anticorrelated, even if they’re independent. See Causality by Judea Pearl.